That is really an object lesson in the dishonesty of police-hating leftist media and race-baiters who are determined to make all police racist, and to make everything that ever happens proof of unbridled racism by white people. The video you’re about to see is being presented as an example of racist white cops brutalizing an innocent black man, whom they were harassing in the first place because all he did was jaywalk. That is not what happens here. At all. What actually happens is that the man in question, one Johnnie Rich, was harassing people and taunting police officers, all so he could lure them into a confrontation that would then allow him to feign being abused. Rush in a parking lot he was passing through in late August 2017 on his way home from a dishwashing shift at a Cracker Barrel restaurant. The officers claimed Rush was trespassing and jaywalking because the parking lot was attached to a business that was closed for the night. Well that sounds pretty bad, doesn’t it? But you watched the video. So how does the HuffPo account use omission or misdirection to make this sound like something other than what it is? For starters, Rush is not merely “jaywalking” in the sense that he tried to cross the street somewhere other than a crosswalk. 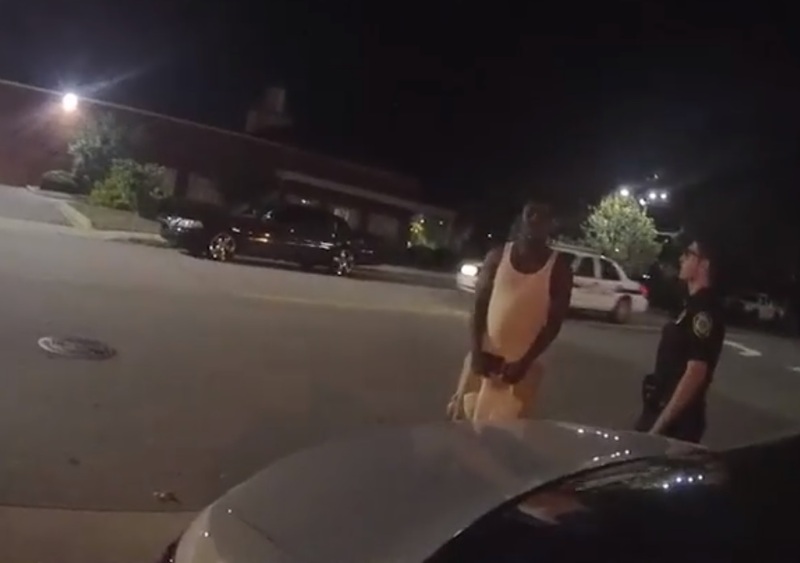 Officers comment on the fact that he had run out into the street multiple times in front of cars, and was harassing the people in the cars as well as cursing at the officers when they approached him. Secondly, you clearly hear the officers mentioning Rush by name as they approach the scene. They know this guy. They’ve had dealings with him before. And you can tell by the way they say his name that he’s got a reputation as a troublemaker, and that they’re not surprised to see him acting this way. Third, Rush attempts to flee, when all the officers are going to do is give him a ticket for jaywalking. Why would you flee? They’re not going to take him to jail. They’re not even going to put him in handcuffs if he stops arguing and simply cooperates with them. They’re just going to give him a ticket. And yet he runs. Now, when you run, it doesn’t matter what the cops initially stopped you for. They’re going to chase you, catch you and put you in cuffs. Even if it did start out as mere jaywalking (which is not what really happened in this case), as soon as you run, you’re now fleeing and eluding and that’s a much more serious matter. You’re going to get taken down. Fourth, even after they catch him, Rush continues to resist and struggle. All he has to do is put his hands behind his back and the incident is over. But he keeps fighting them. That’s why he got roughed up. Once you’ve decided to flee – especially if the cops haven’t had a chance to pat you down yet – they have to view you as a threat because as far as they know you could have a weapon on you. It’s imperative that they get handcuffs on you to get you under control, and they will use whatever force they have to in order to do that. If you fight them and you get beaten up as a result, that’s 100 percent on you. Fifth, his continued declaration that he can’t breathe is obvious and transparent nonsense. For one thing, if you can continually yell, you can breathe. A person who really can’t breathe doesn’t sound anything like the way Rush sounds here. For another thing, if you watch many similar videos of modern-day police/citizen interactions, you’ll see that the “I can’t breathe” claim has become standard boilerplate among belligerent minority suspects trying to drum up accusations of racism by cops. They learned it from the Ferguson narrative. When cops are trying to cuff you, keep struggling and yell, “I can’t breathe!” Especially if there are cameras rolling. Sixth, the claim that Officer Chris Hickman used a racial slur against Rush in the hospital appears to be Rush’s word alone. This is the same guy who obviously lied when claiming he couldn’t breathe. If there were no other witnesses to this, it should be treated as obviously false. Hickman ended up resigning over this. That is a disgrace. He did nothing wrong. And Ashville Mayor Esther Manheimer is a complete and total disgrace for the way she sold out her police officers and offered a mealy-mouthed apology to the man who caused this entire incident, and from what I can see, did so intentionally. This is the sort of incident that’s leading to attacks on police by politicians, and to idiocy like the protests by the NFL anthem-kneelers. Yet in almost every case, when you look at what actually happened, you see that the police are being slandered and the media are completely misrepresenting what happened to further a narrative. I hope some other police chief who cares about the truth sees this and decides to offer Chris Hickman a job, hopefully in a city where the mayor supports police officers and is not a disgrace like Esther Manheimer.